Update: I’ll be meeting in San Francisco with the owner of the SkyKids Taiwan camp this weekend. If anyone has questions, please send them on to me. Barnard Asian Pacific Language Academy, located in beautiful San Diego, California, is the only public school in the San Diego Unified School District that offers Mandarin immersion. In 2007, the school started a Mandarin FLES class. In 2010, the school launched a Mandarin immersion program for students in kindergarten and grade 1. In kindergarten, 80% of the Mandarin instruction is taught by a native Chinese teacher, who teaches Chinese literacy, math, social studies, science, music, and art. English instruction (20% of instruction time) is taught by a native English teacher and focuses on English language arts. From grades 1-5, the program follows a 50% Mandarin and 50% English model. In addition to language arts, the partner teachers have shared responsibilities for teaching math, social studies, science, music, and art in their specific language. Greenville Public Schools is located in one of Michigan’s prime living areas, between Grand Rapids and Lansing. The district includes the city of Greenville and parts of seven townships in three counties in West Michigan. It has a history of strong education, many recreational areas, and industrial opportunities. Proximity to Grand Rapids provides many cultural, recreational, and educational advantages. It is 133.6 square miles in size and has a population of about 18,000. Our immersion program is the only one in our intermediate school district. Unlike even a few years ago, more and more books are becoming available that are both readable by Mandarin immersion students and also age-appropriate. That’s great news, because reading has long been the downfall of MI kids, there just wasn’t anything they could read that was also fun to read. I call it the Captain Underpants problem — where are the books your kid sneaks to read under the covers, in Chinese, as they might with the Captain Underpants series? They posted a New Year’s blog post that parents with elementary age students might find interesting, as they’re moving into books for younger readers. in high school it is typically 3-4th year Chinese students, in Chinese dual-immersion programs it is usually 4th to 5th grade students, and in College programs it is usually students somewhere in the middle of the second year. Nice to hear that your 4th grader is reading what it takes a high school student four years to get to! To start off the new year right, we want to communicate with you on what we have been working on. Just to bring you up to speed, Mandarin Companion is largely a two-man operation consisting of John and myself. This is why at times it takes us longer to release things than perhaps it would normally. That being said, we’ve been developing a lot of things behind the scenes. Today we are pulling back the curtain to give you a preview of what Mandarin Companion has in store for you in 2019. Over the years, we’ve received many emails from readers asking for new levels. During the same period, we’ve had the opportunity to attend a number of Chinese language teaching conferences and speak with Chinese teachers about the challenges they face in the classroom. Finding suitable reading materials is a fundamental problem faced by Chinese teachers everywhere. Finding books that are level appropriate for Chinese learners and are fun to read is like finding the holy grail, and for teachers who have used the Mandarin Companion series with students, they absolutely love them and students who do read them experience a lot of progress. The downside to all of this is that it typically takes students longer than they would like to get to the stage where they can read our level 1 books; in high school it is typically 3-4th year Chinese students, in Chinese dual-immersion programs it is usually 4th to 5th grade students, and in College programs it is usually students somewhere in the middle of the second year. Unfortunately there are too many students who drop out of Chinese programs because they don’t feel like they are making progress or that Chinese is even within their grasp and consequently never reach the level necessary to read a Chinese graded reader. For anyone who has experienced the immense sense of accomplishment from reading an entire book in Chinese, that experience alone has motivated countless readers to continue studying Chinese. This has given us the impetus to create a new and lower level of Chinese graded readers in a way that has never been done before. Since we have yet to come up with a good name for this level, we are internally referring to it as “level 0”. Similar to our other levels, it will be based on a defined character set and any new words occurring outside of that set will be introduced as keywords accompanied by pinyin and a definition. This new “level 0” will be written at a 150-character standard which essentially comes from half of the level 1, 300-character standard. The trick about level 0 is that it will not use any new characters outside of the level 1, 300-character standard. That means that any key words used that fall outside of the 150-character standard can only be borrowed from the level 1 standard. Therefore the vocabulary used in the level 0 standard will be very constrained. We have roughly 10 nouns to work with and a very limited set of verbs. Honestly, at the beginning, the task seemed insurmountable, but we organized the possible words we can use and kicked our creativity into high gear to come up with some new stories that can be written at this level, are of substantial length, and are entertaining to read. These level 0 stories will be written at the 150-character standard and will be three to four thousand characters long. Nothing like this exists yet! They’ll be actual books, not just short stories. These new lower level stories will reach learners at an even earlier stage and not only help to accelerate their learning, but also inspire them to continue learning Chinese. We are working on five stories to be released in 2019 including “Young Sherlock Holmes” and “My Teacher is from Mars”. We plan to launch this new level in spring of 2019. It’s going to be great! Both John and I have been working in Chinese education for a long time and people are always asking us for advice about learning Chinese. We find ourselves talking to so many people that we wanted to find a better way to reach out and help even more people through their trek towards Chinese proficiency. Therefore, in early 2019, we have decided to launch the “You Can Learn Chinese” podcast about learning Chinese. In contrast to the many podcasts intending to teach you Chinese, this podcast will be about learning Chinese. We’ll be discussing the best ways to learn Chinese, the research behind it, and include inspirational stories and guest interviews along the way. John and I are really excited about this project! We already have recorded a few episodes that are in post-production and plan to launch the podcast soon. We expect it will be an inspiring and edifying podcast, something that we hope you will find helpful and valuable to you, a Chinese learner. We’ll be sending out notifications on how to subscribe and get involved in the coming weeks! On another note entirely, I also got a note from the folks at Benchmark Education, a company which focuses on textbooks and has a series for immersion students in Spanish and in Mandarin. While not read-under-the-covers books, it’s interesting to see what’s out there for immersion students in terms of social studies and other books. It’s unfortunate they put the pinyin on the same page as the characters, which I believe makes it less useful for immersion students. I’ll admit to getting almost misty-eyed about this one. I first talked to the fantastic principal at Broadway Elementary in Los Angeles not long after their program began. And now those little first graders are heading to high school next year. Kudos to Susan Wang for her foresight all those years ago and her perseverance in the face of not a few hurdles put up by her own school district! 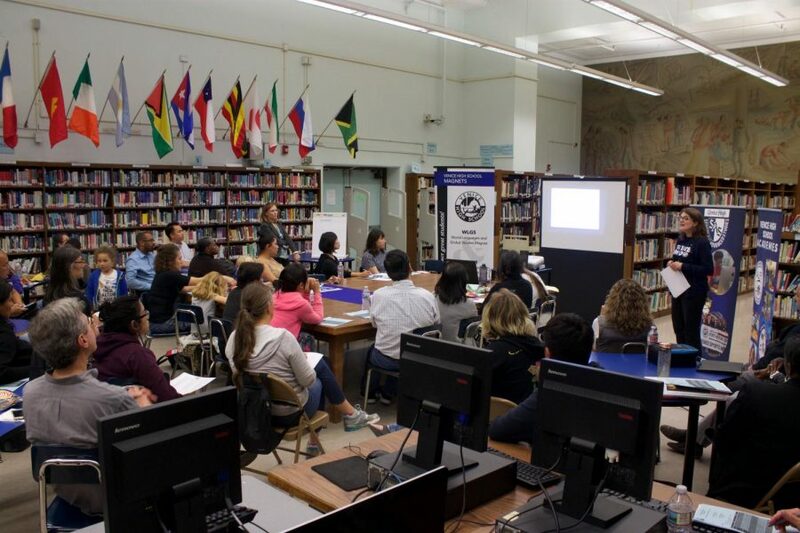 Parents attend an informational session about the upcoming program. Venice High School will be the first high school in LAUSD’s District West to offer two languages as part of a Dual Language Immersion Program in the Fall of 2019. Students in the program will be taught two of their six classes in either Spanish or Mandarin. There’s only one other Mandarin immersion school in the state of Florida right now, in Palm Bay, about half way between Orlando and Miami. It’s the Palm Bay Academy, a charter school. This would be the second. Pinellas Park is on the Gulf side of Florida, near Tampa. PINELLAS PARK – A group of Pinellas County parents have come together to launch a tri-lingual immersion charter school that promotes plant-based diets, healthy eating, environmental awareness and sustainability. King Charter Schools will likely open for the 2020-21 school year with kindergarten and first-grade students, said Maria Solanki, a parent and one of the founding board members. The school will add another grade level each following school year. Although King will be part of Pinellas County Schools and funded by the district, the board needs to raise the initial start-up costs, about $350,000, to open its doors in August 2020.